A Limit in Physical Abilities should not limit your ability to Play any sport. 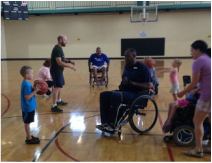 Madison Adaptive Sports Program (MASP) is for those who wish to Play. We will Help to adapt the sport and needs to the Player.